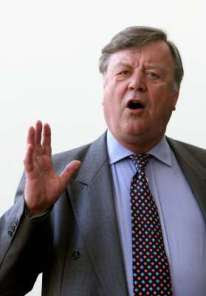 Ken Clarke said: "I expect I will have to wear body armour the next time I meet Theresa. She was at the thing I was at last night but I thought it was too soon to go over and greet her and say ‘it wasn’t my fault’." Oh to be the proverbial fly when they finally do meet. Before giving me these words Clarke admitted he'd probably have to wear body armour next time he sees Theresa May. Click on the quote to go to the full story. "It's not only the judges that all get furious when the Home Secretary makes a parody of a court judgement, our commission who are helping us form our view on this are not going to be entertained by laughable child-like examples being given," said Mr Clarke. "We have a policy and in my old-fashioned way when you serve in a Government you express a collective policy of the Government, you don't go round telling everyone your personal opinion is different."